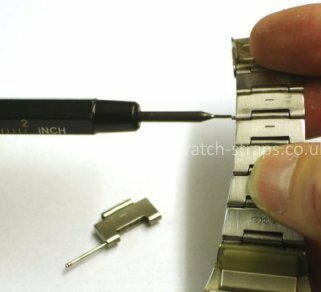 Adjusting the length of your metal bracelet watch strap is not be too complicated with the aid of these instructions. 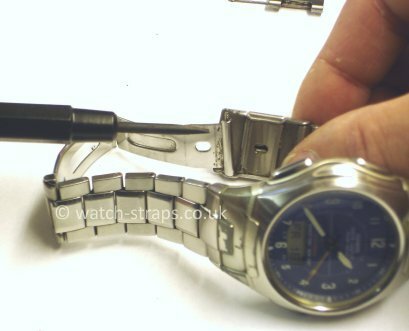 Most metal bracelet watch straps, including the Casio bracelets, are held together by removeable pins that are secured by a central metal ferrule.  A thin, pointy object like a bradawl or a drift. A spring-bar removal tool like this one, has one end which can be used as a drift to push out the pins. 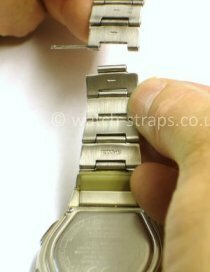  Some padding material to cushion the bracelet to avoid damage to the watch. A computer mouse mat is ideal for this. Once you know how many links you are going to take out, you need to prepare your working area. Ensure that your work area is free from clutter. It is also a good idea to put down a sheet, or some other covering, on to the floor to make sure that any bits that fly off won't get lost. 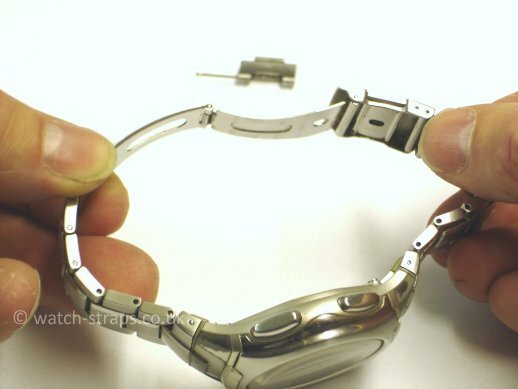 Firstly, in order to get to the underside of the bracelet and make the link removal easier, it is necessary to separate the bracelet at the clasp. 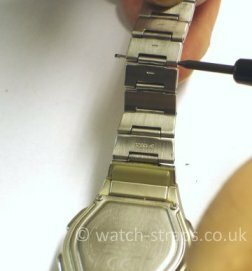 To do this remove the spring bar from the watch strap clasp so that the bracelet is separated. Use the bradawl or spring bar removing tool to compress the spring bar and lever it out of the clasp. Be careful that it doesn't spring across the room. 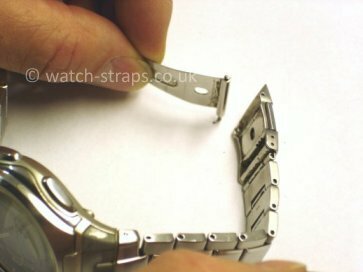 You will notice that there are two sets of holes on the otherside of the clasp which will allow you to make a small adjustment to the bracelet length if necessary, once the links have been removed. (See picture below). Now to remove a link, choose which link you are going to take out, and use the bradawl or spring bar removing tool to push the pin that secures that particular link, following the direction of the printed arrows on the underside of the metal link. 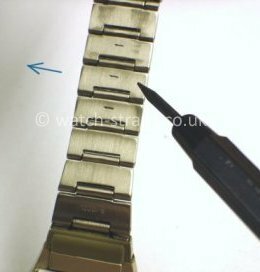 Careful here as some of the later Casio metal bracelets have ferrules which can fall out of the link. The ferrule will be needed (to hold the pin in the remaining link). If you need to, repeat the process and remove another link on the other side of the clasp. When you have removed as many links as you need to you can join the bracelet back together. To do this, place the ferrule, if there is one, in the middle of the link that you are joining up, and, this time working against the direction of the printed arrow, push the pin back into the hole, engaging the ferrule. If you need to, you can gently tap the pin back into place using a small craft hammer or push the pin against a hard surface to force it home. 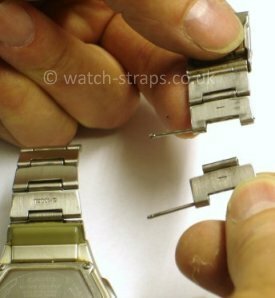 If your Casio bracelet doesn't use ferrules you need to push the closed end of the pin against the arrow direction. The open end of the pin can be identified as its end looks like the open end of a split pin and looks like a slot for a screwdriver. The closed end is the opposite end to this and has no markings. 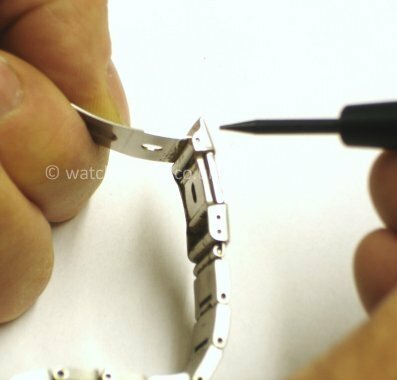 To reconnect the clasp, you need to do the reverse of the disconnecting process, ensuring that it is the right way round before fitting the spring bar.